Eel Pie Island, Twickenham, famous as the 1960s haunt of Jazz and R&B music legends, was also home to the inventor of the wind-up radio powered by winding a crank to drive a generator instead of relying on batteries or an external electrical source. Born 13 May 1937 in Southall, Trevor Graham Baylis left Dormers Wells Secondary Modern School to work in a local Soil Mechanics Laboratory in Southall where he was able to study mechanical and structural engineering at a local technical college. A keen swimmer, he represented Great Britain in the sport at age 15; narrowly failing to qualify for the 1956 Summer Olympics in Australia. In 1959, he began his National Service as a physical-training instructor with the Royal Sussex Regiment and swam for the Army and Imperial Services. On leaving the army he took a job with Purley Pools, which made the first free-standing swimming pools. Initially working in as a salesman he later switched to research and development. His swimming skills drew the crowds at demonstrations, which in turn led to his forming an aquatic-display company. As a professional swimmer, stuntman, underwater escape artist and circus entertainer, Baylis earned sufficient money to set up Shotline Steel Swimming Pools, a company supplying swimming pools to schools, and by 1970 to set up his home and workshop on Eel Pie Island. Baylis's work as a stunt man saw many a colleague ending their careers due to injury. By 1985 he had begun to invent and develop a range of products for the disabled under the banner Orange Aids. The spread of AIDS in Africa by the early 1990s led him to consider radio as a means of helping halt the spread of the disease through education and communication. The first prototype of his best-known invention was born of a transistor radio, an electric toy car motor and the clockwork mechanism from a music box. The prototype worked well, but he struggled to find a production partner until appearances on BBC World Service and BBC TV’s Tomorrow’s World in 1994 threw up an investor. Having formed the company Freeplay Energy in 1996, the wind-up radio won the BBC Design Award for Best Product and Best Design. In the same year Baylis met her Majesty the Queen and Nelson Mandela and travelled to Africa with the Dutch Television Service to produce a documentary about his life. He was awarded the 1996 World Vision Award for Development Initiative that year. The following year, however, a smaller and cheaper version of the Freeplay radio was in production in South Africa using rechargeable cells with a generic crank generator. Following the subsequent difficulties he faced over patenting, he set up the Trevor Baylis Foundation to promote the activity of Invention by encouraging and supporting Inventors and Engineers. This led to the formation of Trevor Baylis Brands PLC to provide inventors with professional partnership and services to enable them to establish the originality of their ideas, to patent or otherwise protect them, and to get their products to market. Their primary goal is to secure licence agreements for inventors, but they also consider starting up new companies around good ideas. In the 1997 Birthday Honours, Trevor Baylis was awarded an Order of the British Empire (OBE) for humanitarian services. As well as being awarded 11 honorary degrees from UK universities, he received honorary doctorates from Heriot-Watt University in 2003 and Leeds Metropolitan University in 2005. In the 2015 New Year Honours he was made Commander of the Order of the British Empire (CBE) for services to intellectual property. In 2001, he completed a 100-mile walk across the Namib Desert demonstrating his new electric shoe invention and raising money for the Mines Advisory Group. The shoes were developed in collaboration with the UK's Defence Evaluation and Research Agency and use piezoelectric contacts in the heels to charge a small battery that can be used to operate a radio transceiver or cellular telephone. 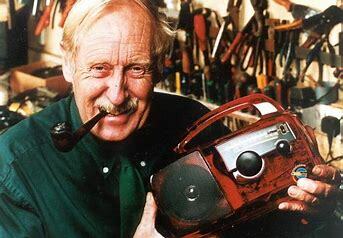 Despite a long illness, Trevor Baylis was a popular character on and around Twickenham Riverside. His interest in the local history first manifested itself with the Twickenham Museum where in 2005 he took part in a reenactment of an earlier local stunt diver, Professor Cockles. An early Freeplay radio he donated to the museum is regularly on display. The Eel Pie Museum devotes an entire section to his life and times as very much part of the island scene. Trevor Baylis died on 5 March 2018 aged 80. Baylis, Trevor. 1999. Clock This: My Life as an Inventor. Headline Books. I went to a secondary modern school and wasn’t too bright academically, but my father gave me a Meccano set when I was a youngster and from then on I was an engineer.